Passion (Palm) Sunday is next Sunday, 9 April. As usual, the 9:00 a.m. Mass will commence with a procession, starting in the school playground near the parish hall. All other Masses will commence with a solemn entrance beginning in the parish centre. Processions have long marked solemn celebrations in our Church; please take this opportunity to participate in a solemn and prayerful way through word, movement and song. Stations of the Cross, 9:00 a.m. THE EASTER VIGIL MASS, 7:30 p.m. 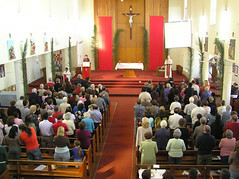 Masses, 7:00 a.m., 9:00 a.m., 10:30 a.m.
Communal Form, Tues. 18 March, 7:30 p.m. Individual Form, Good Friday, 9:30 – 10:30 a.m.